My Gurudeva, nitya-lila pravista om visnupada Sri Srimad Bhakti Prajnana Kesava Gosvami Maharaja gave me initiation, trained me, and then said to me, "Now you should preach everywhere, and try to help devotees here and there - especially those who have become weak." In his last days, when my siksa guru, nitya-lila pravista om visnupada Sri Srimad Bhaktivedanta Swami Maharaja was departing from this world, he placed my hands in his and, weeping, said, "I have collected so many disciples. And in Bengali he said, "I have collected so many monkeys from all over the world, but I could not complete their training. Therefore, I humbly request you to help them." I told him that I will certainly follow his orders. He told me that he will only remain here in this world for one or two more days, and he left the next day. You should know that your body is not your real self. The body is a bag of urine, blood and so many other nasty things. If you open it, you will only see these things. If a white spot appears on your nose, no one will marry you. Both men and women will hate looking at you. Don't be in the false ego of this body, thinking, "I am so qualified." In a day you may become mad. In a moment you may die. I have heard from my Gurudeva and guru-parampara that in this rotten body there is a soul and Supersoul. We are souls and the Supersoul is looking after us like a witness - seeing what good and bad things we are doing. The Supersoul notes down our activities and gives us the reactions to those activities. He knows, better than us, everything that is in our hearts and minds. We are not any worldly thing; rather we are souls. Somehow we have forgotten the Supreme Personality of Godhead and that is why, since the beginning of time, we have been in the endless chain of birth and death. We have experienced many previous lives before this life. Many times we were hogs, pigs, dogs and cats, and sometimes demigods like Lord Indra or Lord Brahma. We have been searching for happiness everywhere, but we never became happy. Sri Krsna then again mercifully gave us a human body, and when we were in the womb of our mother He said, "You should promise that, 'when I come out into the world I will serve you.'" We have forgotten this promise and that is why we are suffering. In the ocean, waves rise higher and higher and then causes floods everywhere. Similarly, bundles of problems are continuously befalling us, and then we will die, and then problems again come when we take birth again - unless we are remembering Lord Krsna, chanting His name and worshipping Him. Our aim and object is to serve Him. By our transcendental constitution we are servants of Sri Krsna - maidservants of Krsna - but we have forgotten everything about that service. Now we are very happily enjoying sense gratification like hogs and pigs, but we should remember that one day we will become old. We are bound to become old, and our beauty will leave. Then, after some time, at most around the age of 100, we will have to die. What can you take from this world? What you have collected from this world or are still going to collect, you cannot take with you - not even one paisa, nor one farthing nor one hair. You have come with nothing and when you leave you will have nothing. So why are you doing so much hard labor from morning to night - working like donkeys and monkeys? One thing to remember: You don't want any suffering or problems in life, but they come, as a result of your fruitive activities. You are bound to that suffering even though you do not want it. Similarly, even if you have not tried for it, still happiness will come - if you have done anything good in your past life. Whether you are endeavoring for happiness or not, it will come automatically; so why be worried for this? Why not chant and remember Krsna? Constant remembrance of Sri Krsna is the aim and object of our life. Prince Charles was so wealthy and powerful, but still he suffered. Ravana's servants all had beautiful golden houses, but what became of them? Princess Diana was beautiful and world-famous, but in a moment she died in a car crash. She didn't want it, but it came. Try to remember this. Try to be engaged in performing bhajana. Your wife and children may cheat you, but Krsna's name and Krsna Himself will never cheat you. Lord Krsna is very powerful. In a moment He can create millions of universes, and again, in a second, He can demolish them and again create them. 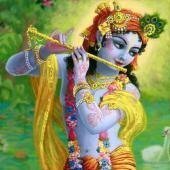 He is causelessly merciful, very sweet, and very beautiful as He plays on His flute and smiles. The whole world is enchanted by His beauty - even animals and birds. He has invested all his power, beauty, mercy and all other qualities in this 16 word mantra - in three names: Hare Krsna Hare Krsna Krsna Krsna Hare Hare, Hare Rama Hare Rama Rama Rama Hare Hare. Have strong faith that what you cannot accomplish by your great endeavor of making money by laboring day and night, you can accomplish in a second by chanting Hare Krsna. I never do anything for my maintenance, but you are all maintaining me. You are bound to maintain me because Krsna has given you inspiration to do this. You have heard from scriptures that if you help me and serve me, Krsna will be happy. These are the rules and regulations of the Bhagavad-gita and Srimad-Bhagavatam. Somehow try to maintain your life. If you are grhastha (married), no harm; If you are brahmacari (celibate student), no harm; if you are a sannyasi (in the renounced order), no harm. From wherever position you are in, try to be in the good association of pure Vaisnavas. Sri Krsna will arrange this if you pray from the core of your heart. He will send your Gurudeva to your door. You cannot search for a Guru. You have no idea how to recognize his qualifications. In millions and millions of births you cannot know this on your own, but Krsna will mercifully send a qualified guru if you are sincerely desiring this. You have not called Padmanabha Maharaja or Nanda Kisora prabhu here. Krsna has given inspiration in my heart to send them, so I sent them. They came to please me. I came here myself, by my mercy. I was weeping for you, and now I am very happy for you. I always remember those who are serving. I am always remembering Lalita. She may forget me, but I cannot forget her. I cannot forget Bala and his brother Vijaya, and I cannot forget my senior devotees sitting in the back in a group, like Amala Krsna, Kesava, Isvara Puri, Gauraraja and Acyutananda. There are so many seniors here - both men and women. I have come to remind you to not be weak. If you are unmarried, remain unmarried. If you are divorced, then do not remarry. Take shelter in the lotus feet of Krsna. I have given you in marriage to Krsna. Don't go again in the burning ocean. Krsna's service is the aim and object of our life. Always chant: Hare Krsna Hare Krsna Krsna Krsna Hare Hare, Hare Rama Hare Rama Rama Rama Hare Hare. My doctor has advised me that due to my age I should not travel so much. You are all serving me greatly by giving me medicines that will make me well, so it may be that I will travel for some more years. But after that you will have to come to India to meet me. I am reminding you all - never be weak. Don't lose your faith in Guru Your Guru is bona fide and very strong, and he will never fall.